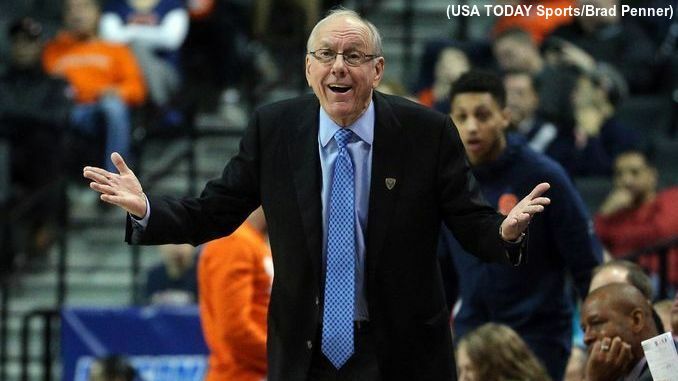 Syracuse coach Jim Boeheim reacts to a play in the first half. MANDATORY CREDIT: Brad Penner-USA TODAY Sports. For the fourth time in five games, Syracuse made at least 11 three-pointers while shooting 40 percent from deep. As with the previous three times they did that, the Orange (15-6, 6-2 ACC) pulled out a victory Wednesday night, this time holding on in the final minutes for a 77-71 win at Boston College (11-8, 2-5). SU had its second-best shooting effort of the season, connecting on 55.8 percent of its field goals. The three Syracuse guards who saw action, Tyus Battle, Buddy Boeheim, and Frank Howard, combined to make 20-of-31 shots on the night, good for a 64.5 percent mark. The Eagles were slowed down by the Syracuse defense just enough in the second half after making 50 percent their first half shots. SU also converted 14 BC miscues into 18 points, which helped on a night when the hosts drained 20-of-23 at the free throw line. After the Orange got the opening basket of the night, Boston College jumped all over their guests, ringing up ten straight points. A couple minutes later, though, SU ripped off 14 straight points to jump in front. Elijah Hughes started the streak with back-to-back threes. Tyus Battle then sliced in from the left wing and finished with a nifty scoop, forcing a BC timeout after drawing Syracuse within a single point. After the game resumed, Oshae Brissett slipped free on an inbounds play and hammered home a dunk. Brissett then finished through contact for another bucket and Frank Howard closed the run with a jumper inside the top of the key for a 20-15 Orange lead just past the midpoint of the first half. The Eagles cut the gap to a single point, but SU started lighting up the rim from deep, hitting four threes in as many possessions. Buddy Boeheim knocked down one from each wing, including a deep hoist from the right side, then Marek Dolezaj added one of his own. Battle came off a screen to hit from straightaway, pushing the Syracuse edge to 32-25. Boston College scored seven of the game’s next nine points to draw within a deuce, but Howard and Battle combined for five straight points to push the margin back to seven. Howard then answered an Eagle three by splashing one from the left wing for a 42-35 lead at the break. Battle connected on a contested jumper and Brissett fed a cutting Hughes for a lay-in and an 11-point lead early out of the break, forcing another time out from the hosts. BC retaliated with a pair of triples, clipping the margin to 46-41 and drawing a time out from the Orange before the half was four minutes old. Shortly after, BC would ring up a half dozen straight points to close within 51-49. SU replied two-and-a-half minutes later with a 9-2 run to gain some breathing room. Battle drained a pair of threes around an Eagle lay-in and Brissett drove across the lane for a right-handed finish while fouled. His free throw stretched the lead to 62-53 with 9:31 on the clock. Less than two minutes later, Boston College got within 65-60, but Boeheim’s third triple of the night pushed the lead back out to eight. Syracuse held fast, nudging the lead to 72-62 after consecutive scores, the latter coming on a Boeheim steal and breakway lay-up. The SU defense gave up a pair of scores, but got a couple of stops. Paschal Chukwu grabbed a pair of offensive boards to help leak out the clock. A flurry of Eagle three-pointers failed to go home in the final 20 seconds, allowing Syracuse to hold on for the 77-71 win. Tyus Battle led the way for the Orange, pouring in 31 points while also handing out six assists. The junior guard was 11-of-17 from the floor, including 4-of-8 from behind the arc. Buddy Boeheim was 5-for-7 in the game, including three treys, as he dropped in 13 points off the bench. Elijah Hughes added ten points while Oshae Brissett and Frank Howard chipped in with nine apiece. Ky Bowman and Jordan Chatman topped the Eagle attack with 21 points each. The duo combined for seven three-pointers, Chatman connecting on four. Jared Hamilton contributed a dozen points and Nik Popovic had 11. The Orange will cap this three-game road stretch on Saturday when they complete their season series at Pittsburgh. The Panthers (12-9, 2-6) have dropped four straight games, including an 82-69 game at Clemson on Tuesday night. SU beat Pitt at home in their first matchup two Saturdays ago, 74-63. Syracuse used an explosive 22-4 run in the second half to take a 20-point lead and cruised from there. Tyus Battle scored 15 of his game-high 22 points in the second half while Jared Wilson-Frame hit five triples as he led the Panthers with 19 points. Saturday night’s affair will get underway at 6:00pm Eastern and be televised by ESPN2, as well as streamed online at ESPN3.com and through the ESPN app.